Custom Designs for Ultimate Protection. 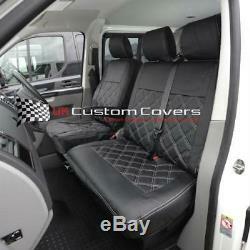 VW TRANSPORTER T5 T26 T28 T30 T32 TAILORED LEATHERETTE SEAT COVERS 2003 ON 209. 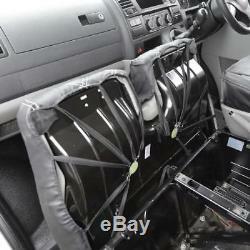 The same leatherette material is used over the entire seat cover and all of the headrest locators have been fitted. Please note these seat covers come with an Ivory bently stitch. 1 x single drivers custom seat cover 1 x double passenger custom seat cover 2 x driver custom armrest covers 3 x custom headrest covers. Additional charges will apply for the following areas. Republic of Ireland, Channel Islands, Northern Ireland, Isle of Man, Scottish Islands and Highlands plus all other Islands off the mainland. Wherever you live, UK Custom Covers will endeavour to deliver direct to your door. This does not affect your statutory rights. 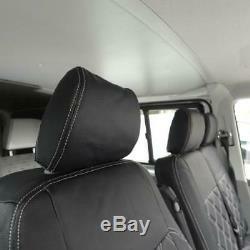 The item "VW TRANSPORTER T5 T26 T28 T30 T32 TAILORED LEATHERETTE SEAT COVERS 2003 ON 209" is in sale since Thursday, June 29, 2017. This item is in the category "Vehicle Parts & Accessories\Car Parts\Interior Parts & Furnishings\Other Interior Parts & Trim". The seller is "ukcustomcovers" and is located in UK, Portsmouth. This item can be shipped worldwide.